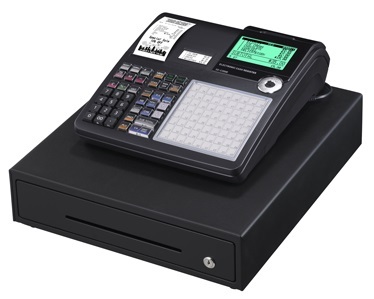 The Casio SE-C3500 cash register is part of a new line of cash registers that help activate retail businesses. The SE-C3500 is the twin station model with combination keyboards, suitable for all retail businesses. Support for 7,000 price lookups (PLU's) and use at up to 72 departments (30 x 2 departments for the C3500) makes these registers suitable for use in department stores and other stores carrying a wide variety of products and cafes and restaurants with large menus. The scanner function promotes quick and easy price registration. This printer can print a journal containing the sales amount and transaction details together with receipts. Since journal data can be recorded and stored, it can be used for confirmation, totalling analysis and other purposes. 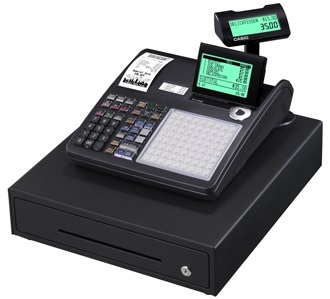 Stylish registers with large 10-line LCD. Ease of viewing for both operator and customer. Handy displays and innovative display functions. A wide range of functions that boost productivity. Height: 250mm Depth: 450mm Width: 400mm. Click the button below to add the Casio SE-C3500 Electronic Cash Register to your wish list.